Check it out! I crack up when people wear almost the exact same outfit to practice. Unlike a normal team that requires you to bring a both black and white scrimmage jersey to practice, we mix it up and require pink and green. Almost everybody on the team has our standard HoTRD bright green tank. 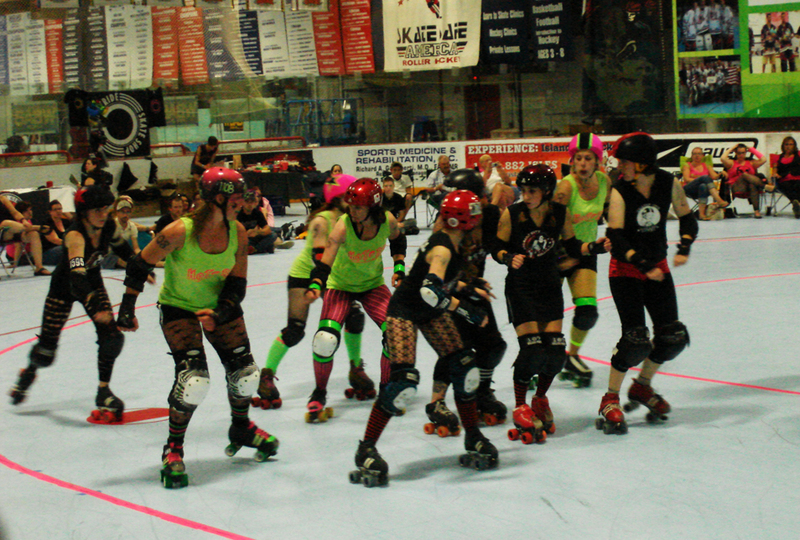 Epic Kate-tastrophe and Deadlie Mercury also happened to wear that very similar hot pink shorts on Monday night! Thank you Epic and Deadlie for letting me snap this precious picture after practice, despite how sweaty y'all are. Also, can we talk about how Deadlie is a towering giant? She has her skates on in this picture, but don't let that and her slouched posture fool you. I think she's probably 6 feet tall. One of my favorite pictures of her is in this blog post from back in the summer. Flexi is definitely crazy about pink and green. Read her crazy post about our colors on the Times Union Roller Derby blog. Not too much else to say. 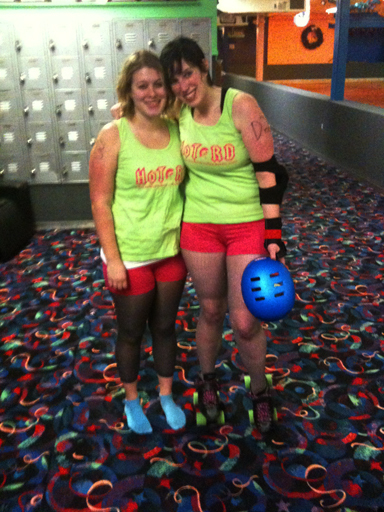 Here's a picture from when we debuted our bright green tanks. They definitely stand out.